08/27/15 - 1:30 -Syndicated food columnist Linda Gassenheimer, Special wine correspondent Fred Tasker and WLRN hosts Joseph Cooper and Bonnie Berman interview Debi LaBelle, from the Education Fund and Cathy Nunnally a teacher from Charles Wyche Elementary. Topic: The Edible Garden Program and Food Forests in the Miami Dade County Schools. The gardens and forests grow fresh produce year-round, are used in school meals and are tended by teachers and students. Cathy brings produce from her school garden for us to taste on air. This simple one-dish meal made with shiitake mushrooms, chicken, cashew nuts and an Asian dressing is perfect summer evening fare. It can be served warm or at room temperature. I’ve given substitutions for some of the Chinese ingredients, so that you can make this salad with ingredients you have on hand, if you prefer. Sesame oil lends a nutty flavor. Toasted sesame oil can be found in most supermarkets. I prefer its more intense sesame flavor. Steamed Chinese noodles can be found in the refrigerated section of the produce department. 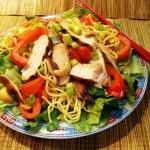 Dried Chinese noodles or angel hair pasta can be used instead. Place a medium saucepan filled with water on to boil over high heat. Mix the soy sauce, vinegar and 1 tablespoon sesame oil together. When water comes to a boil, add the noodles. Boil 2 minutes and drain in a colander. Run cold water through them. Set Aside. Heat the remaining 1/2 tablespoon sesame oil in a wok or nonstick skillet over high heat and add the chicken, garlic, red pepper and mushrooms. Stir fry 1 to 2 minutes. Remove from the heat and add the noodles. Add salt and pepper to taste and the sauce. Toss well. Divide lettuce leaves between 2 dinner plates. Spoon noodle and meat mixture over lettuce. Sprinkle sliced scallion and cashews on top. Makes 2 servings. 1 bottle toasted sesame oil, 1 bottle rice vinegar, 1 package steamed Chinese noodles, 3/4 pound roasted or rotisserie boneless, skinless chicken breast, 1 red bell pepper, 1 small package shiitake mushrooms, 1 bag washed, ready-to-eat Romaine lettuce, 1 bunch scallions and 1 small package cashew nuts. Staples: Low-sodium soy sauce, bottle minced garlic, salt and black peppercorns. White vinegar diluted with a little water can be used instead of rice vinegar. Any variety of cooked chicken strips, pieces, roasted or rotisserie can be used. Regular sesame oil or canola oil can be used instead of toasted sesame oil. Any sliced mushrooms can be used instead of shiitake. Minced garlic can be found in jars in the produce section of the market. Walnuts can be used instead of cashew nuts. A quick way to slice scallions is to snip them with a scissors. Place water for Chinese noodles on to boil. 08/06/15 - Experts say South Florida’s restaurant reputation has vastly improved in recent years. Do you agree? 07/23/15 - 1:30 -In the second half of the program, Coya Restaurant Miami Executive Chef, Sanjay Dwivedi joins syndicated food columnist Linda Gassenheimer, Special wine correspondent Fred Tasker. 07/02/15 - Syndicated food columnist Linda Gassenheimer, and WLRN hosts Joseph Cooper and Bonnie Berman interview Dr. Richard Campbell and Noris Ledesma of Fairchild Tropical Botanic Garden for our annual Mango madness program.